Fall pruning is a garden maintenance task that often gets overlooked. However, fall is the perfect time to prune (some) of your beautiful plants around your yard! This episode is for those of you who need help pruning your garden, including what kind of cuts to make and how to get started. What does it mean to prune a plant? Pruning involves removing parts of the plant to improve it's health, aesthetics, and form. There are 2 Types of pruning cuts: Thinning Cuts and Heading Cuts. Why should you even care about fall pruning? There are 4 main reasons to prune a plant which will help improve the plant for years to come. Listen to this podcast to learn more! Which specific plants should be pruned this fall? You should prune by specific species need. Don't prune everything in your garden. Listen to find out more. What should you do with your fall pruning debris after you cut it? Cut debris can be put back into your garden for nutrients. You could even get really creative and use your debris as art. Check out our Best Loppers For Your Pruning Needs here to learn which loppers we use and recommend! 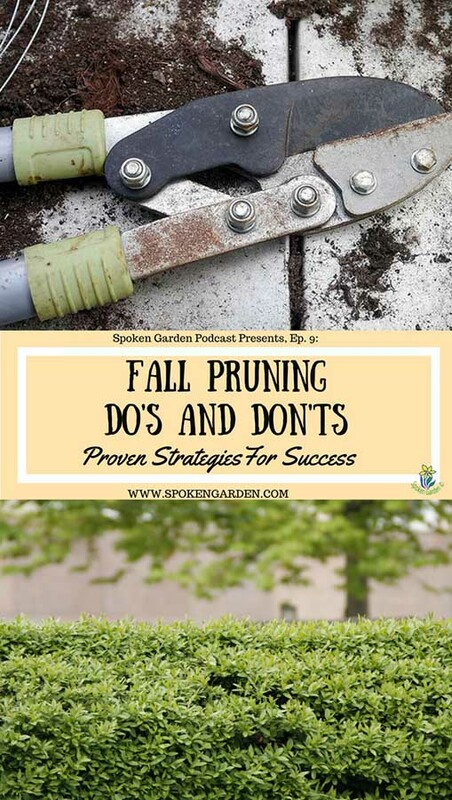 Save "Fall Pruning Do's and Don'ts" to Pinterest for later! Learn how and why to prune your fall garden. "Prune Like a Pro" Cheat Sheet! What it means to prune in your garden or landscape. Why you should care about pruning. Specific trees and shrubs you should and should not prune this fall. After pruning in your garden, what to do with the limbs and sticks you cut. Advice for cutting back herbaceous perennials that have already died back, such as Hosta's, Day Lilies, and both English and Common Daisies. DIY Garden Minute, Ep. 2: Pruning vs. Dead-heading Revealed! Go to WebMD or Mayo Clinic for more info about poinsettia's. Subscribe to Spoken Garden's newsletter today!! Let's Do This! !